In today’s social media obsessed society, it’s hard to find anyone who doesn’t have some kind of social media account, whether it’s Facebook or Twitter, or any of the myriad other “services” that allow people to connect with each other, and in doing so, provide them with a sense of belonging that they might not otherwise be able to achieve. Being “liked” is important to so many people across the world that it’s become akin to having an addiction, but instead of drugs, it’s about being recognised and having your life, and your lifestyle, acknowledged, admired, and affirmed. If you have thousands of followers (millions if you’re a global celebrity), then what does that do for your self-esteem? And equally, what does it say about the people who follow you? With all the advice that’s out there about being an individual, and being true to yourself, how does social media support that? That’s just one of the broader issues addressed in Ingrid Goes West, a movie about appearance and image and wanting to find your place in life. Ingrid Thorburn (Plaza) is a fantasist who’s never learnt how to make friends the “normal” way. Instead she looks to Instagram as a way of meeting new people and beginning new relationships, but at the same time she’s not aware of the ephemeral nature of those relationships. Believing that if she receives a Like on a post then it means she’s made a new friend, Ingrid is predisposed to believing that she has a long-lasting friendship, and that she is important to that person. At the beginning of the movie, Ingrid gatecrashes a wedding and sprays mace in the bride’s face. Why? Because Ingrid wasn’t invited. Later, the truth is revealed: there was no friendship, it was all in Ingrid’s head. A brief spell in a mental hospital combined with the recent death of her mother leads Ingrid to try and reassess her feelings, but she’s undone by an Instagram posting by a social media influencer called Taylor Sloane (Olsen). Ingrid comments on Taylor’s post, Taylor responds politely, which prompts Ingrid to decide to move to California, and using over sixty thousand dollars she’s inherited, do her best to become Taylor’s new best friend. How she does this involves liking the things and places that Taylor recommends, and doing some low-level stalking. Then she kidnaps Taylor’s dog, Rothko, and returns him the next day, leading to Taylor and her husband, Ezra (Russell), admitting her into their lives and the three of them becoming friends. As the movie allows Ingrid the opportunity to make a real and lasting friendship, it also shows how she’s incapable of doing such a thing. Ingrid weaves a web of lies when she doesn’t need to, and does so not just with Taylor and Ezra, but also with her landlord, Dan (Jackson Jr), an aspiring screenwriter and Batman afficionado. But though she does all this, she manages to avoid any major trouble, keeping herself just this side of “normal”, and managing to gain a degree of trust from both Taylor and Ezra that Ingrid herself is unable to return. Inevitably, things start to go wrong. Ingrid’s lies and ulterior motive for getting to know Taylor begin to unravel, but in the process, the movie cannily shows how similar Ingrid and Taylor are, and how both women, in their own ways, are seeking approval and affirmation from the people around them, and the wider world. The role of social media is hugely important to all this, and the dependency that both women have is explored in a way that tries to be non-judgmental but which can’t help but come down on the side of taking a step back and not using social media as a guide to life. Ingrid has mental health issues, so her obsessional behaviour can be explained, but Taylor has used Instagram to create a public profile for herself that isn’t too far from her real personality. So, the movie asks, which character has the real problem? (It’s still both, but at least the movie is trying not to be simplistic in its approach.) In the end, Ingrid is forced along the road to despair, while Taylor remains seemingly unaffected by having a de facto stalker in her life. Though how Taylor would feel about the twist the movie reveals in the final scene, would be worth seeing. 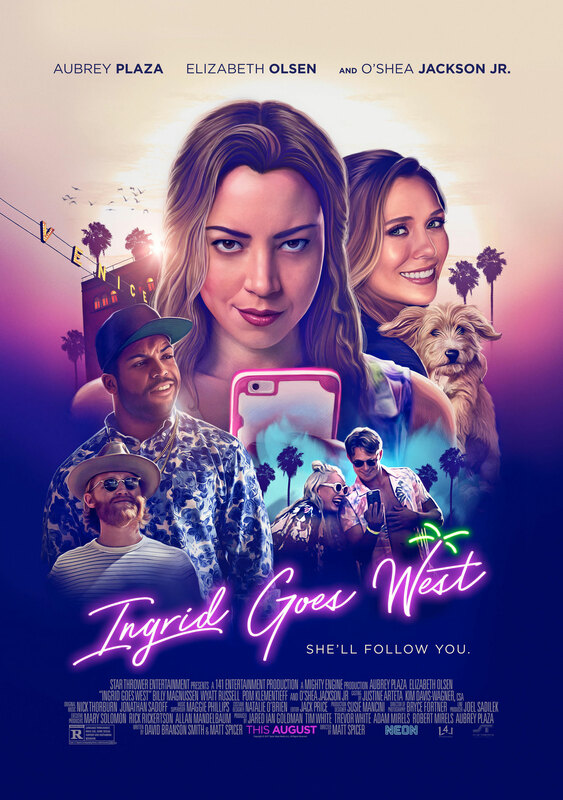 There’s a sincerity and a purpose about Ingrid Goes West that makes its forays into the darker side of social interaction, whether via electrronic devices or in person, far more astute than is readily apparent. This is not a comedy, though there are humorous moments, but instead it’s a tragedy, one that attempts to highlight how the perception of peer pressure isn’t the preserve of troubled teenagers, but can also affect adults as well, and have a much more lasting, negative, effect. The script, by director Spicer (making his feature debut) and David Branson Smith, maintains its tone as a tale of social horror throughout, even going very dark during an ill-judged section of the movie that involves kidnapping and attempted murder, but always returning to the notion that everyone, even the good-natured Dan, is struggling to find themselves and their place in the wider world. Ingrid thinks she’ll find her place by associating with someone she believes is “cool”, while Taylor thinks that’s she’s already found her place by sharing her opinions about what she believes is “cool”. The pervasive nature of social media in our daily lives is reflected by the number of photographs Ingrid takes (as if it won’t be real unless she can record it), the number of posts Taylor shares, and the number of followers that both accrue over time. Both have convinced themselves that their engagement with social media will improve their lives – Ingrid, literally – but both women look and sound as shallow as their dependency makes them. As Ingrid, Plaza gives a desperate, sharply expressed performance that is by turns sympathetic and horrifying, her character’s emotional detachment a reflection of the focus she needs to maintain in order not to ruin things. She treats Dan badly, betrays confidences without a second thought, and doesn’t have a clue about real relationships. Olsen is equally as good as Taylor, the self-made social media guru who’s lost sight of the person she once was, but who can recognise herself in Ingrid’s need to be a part of something bigger than either of them. Jackson Jr brings a much needed sweetness to the role of Dan, but Russell is hampered by his role as a pretentious “artist” who wouldn’t dream of doing anything so banal as selling his work. With stylish cinematography by Bryce Fortner and perfectly judged editing from Jack Price, this is a trenchant, relevant look at a generational battleground that shows no sign of abating, or improving. Rating: 8/10 – a persuasive and intelligent drama that doesn’t hold back in terms of showing how desperate some people can be to “fit in”, Ingrid Goes West is blackly comic in an “if-you-don’t-laugh-you’ll-cry” kind of way that emphasises the dramatic nature of the material; with terrific performances from Plaza and Olsen, and confident direction from Spicer, this is a cautionary tale that should resonate with anyone who’s liked a post by somebody they don’t know in the hope that their like will be liked as well… and so on. Smart and pretty funny. And a little sad. Nice review.